BetOnAces Casino Review: Discover the Games and €100 Bonus! BetOnAces Casino Review: Great Games and Amazing Bonuses! Here it is - one of the classiest online casinos on the internet. Welcome to BetOnAces, a gaming page where you can get a taste of the glitz and glam of a brick-and-mortar casino. Read this BetOnAces Casino review and discover a place where you’ll want to return again and again. BetOnAces Casino features plenty of great bonuses to choose from. The most important one, of course, is the Welcome Bonus. 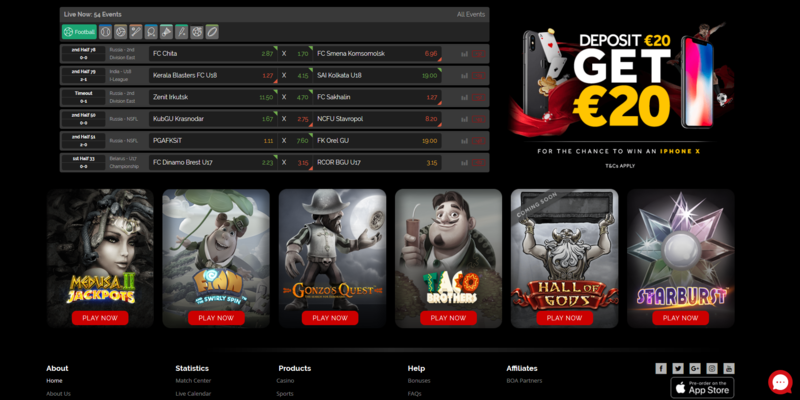 Create a new account right now and receive a 100 percent cash match bonus of up to €100! You’ll end up with two times more money than before! To receive it, you have to log in, click on “Bonuses”, and head straight to “Casino”. Then, all you need to do is claim the offer. You will also receive 300 free spins! When I opened the bonus section, I was pleasantly surprised. It turns out that the Welcome Offer is not the only bonus you get at BetOnAces Casino. There are lots of weekly bonuses where you can get generous cashbacks and even win useful prizes. You can also join their daily tournaments for extra fun! You’ll find all the games you need under two sections: “Casino” and “Live Casino”. But first, let’s take a look at the virtual games on BetOnAces. In addition, the lobby features all the game providers. BetOnAces Casino offers games by such developers as NetEnt, Endorphina, Elk Studios, iSoftBet, and many others. Right now, there are 24 of them on the list. I’ve never seen so many game providers at a single casino. Slot lovers will be glad to discover that BetOnAces Casino features hundreds of slot machines. Classic casino games include blackjack, roulette, baccarat, video poker, and some other choices. Under the “Other Games” section, you can find a few variations of Keno and Bingo. In case you get tired of virtual games, head straight to the Live Casino section. Beautiful dealers will make sure that you’ll have an unforgettable evening of live blackjack, roulette, poker, or baccarat. The site itself is available in the following languages: English, Russian, Japanese, Portuguese, and Swedish. I have good news for those who love playing casino games on their smartphones - BetOnAces has an amazing mobile site! It fully supports all kinds of mobile devices like Android and iOS phones. If you have any questions, feel free to contact BetOnAces’ customer support. An agent will be more than glad to help you solve your problems. The live chat button is at the bottom right of the screen at all times. As an alternative, the casino has an email at support@betonaces.com. Of course, you can always check out the FAQ section first. BetOnAces offers everything a great online casino should have. Its vast selection of games makes it better than an average online gaming site. Here, you’ll never run out of slots, blackjack, roulette, and even live casino games. In addition, BetOnAces is perfect for those who prefer mobile experience. There are many deposit options on BetonAces. You can choose the most convenient one for you.